* Believed to be 1st Lt Edward H Davidson but the airman is not in officer's uniform. He is more likely to be part of the aircraft's ground crew. Delivered Lincoln 12/9/44; Dow Fd 25/9/44; Assigned 731BS/452BG Deopham Green 28/9/44; transferred 332BS/91BG [LG-D] Bassingbourn 7/12/44; 17m taxi collision with 43-38306 with Joe Troccolli 4/4/45, Salvaged. RUSTY DUSTY. 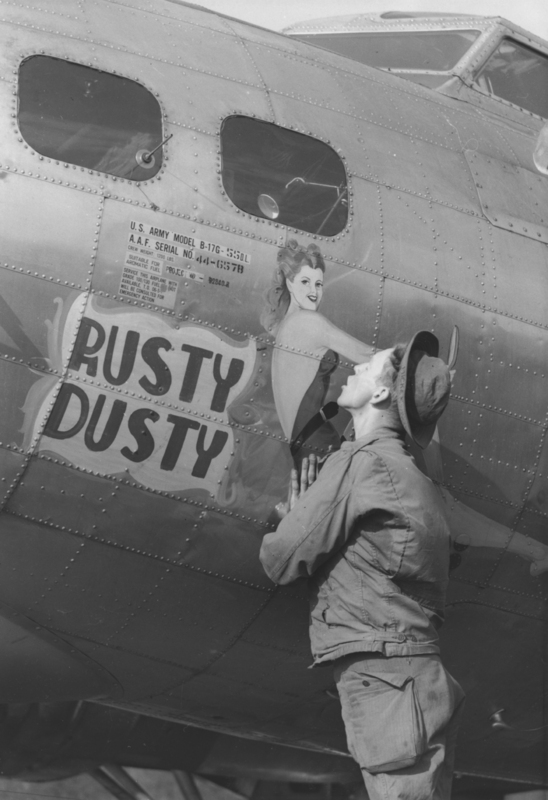 Looking at the airman's clothes and hat I think it's likely that he is one of the aircraft's ground crewmen.